Author: Tolme, Andre Set In . . .
What golfer hasn’t daydreamed about quitting his job, tossing his clubs in the trunk, and just taking off? Granted, most of us don’t dream about taking off for Mongolia, but then again, André Tolmé — the New York Times's Golfer of the Year — isn’t like most of us. This is a book of gonzo golf writing that spans continents and cultures. 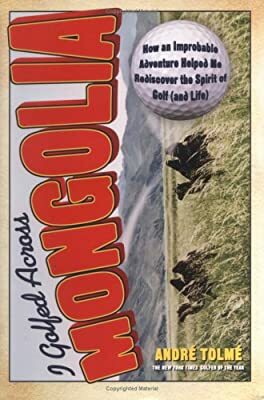 It starts in 2004 when Tolmé, a thirty-five-year-old civil engineer from New Hampshire and all-around ordinary guy, quits his job and travels to Mongolia with a 3-iron, a backpack full of golf balls, and a dream of golfing his way from one end of the country to the other. At 2,322,000 yards — more than 1,200 miles — the home course of Genghis Khan would be the longest ever played, and par would clock in at a daunting 11,880. In I Golfed Across Mongolia, Tolmé skillfully blends adventure and golf writing to create a wholly unique book that will delight all those united around one universal passion: golf.